"Adam Wylie (facing) is Coordinator of both the local health unit, Outreach Urban Health, and of Partners in Community Collaboration. 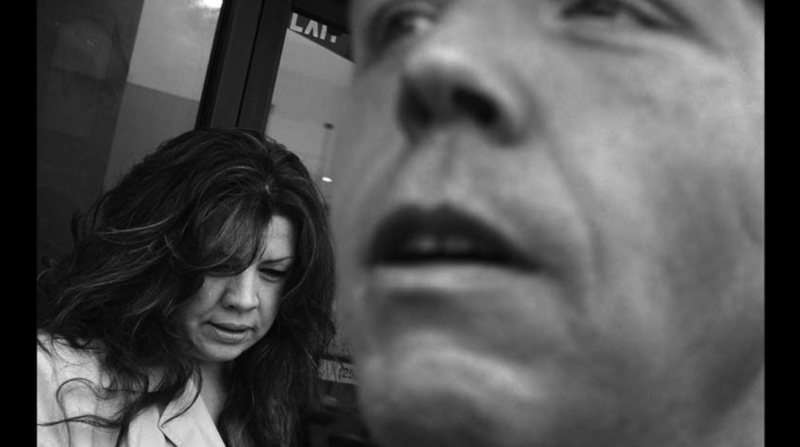 He took Frontline Health photojournalist David Campion on a tour of the community he serves." 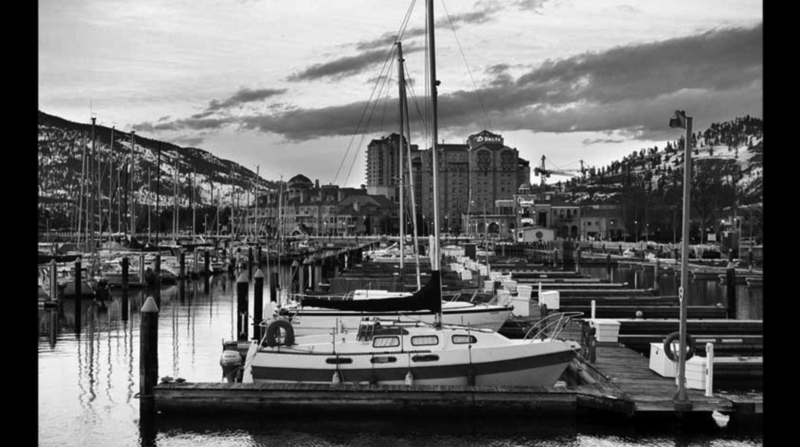 "Over the last few years Kelowna has begun to change. It's become a noticeably more affluent city. People are buying second homes or retiring here and the [city] planning seems to be catering to this demographic. 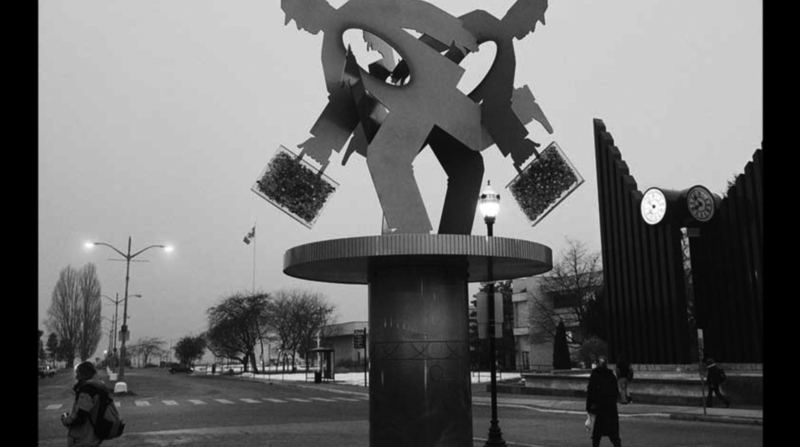 The overall idea seems to be aimed at making Kelowna a destination city." 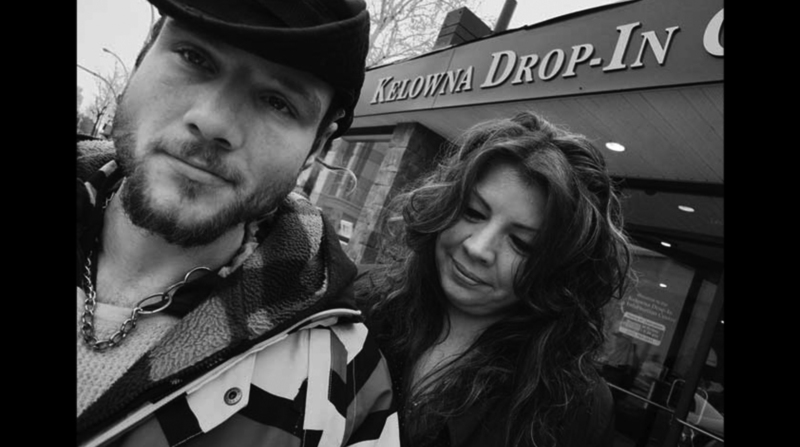 "We have about 500 homeless and 5,000 under-housed persons in Kelowna and the number isn't shrinking. As the gap between income, rent, and the general cost of living keeps growing it increases stressors for everyone, especially our more marginalized populations." "There are a lot of different sources of support and care, but our clients found it really hard to put them all together. 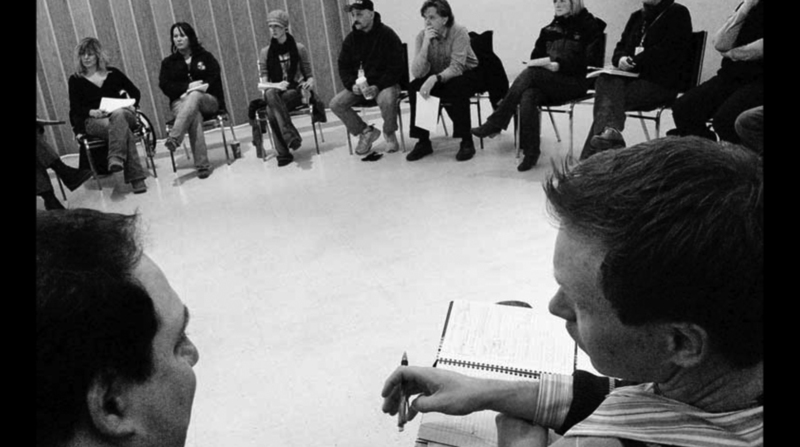 A couple of years ago people from four or five of the service agencies met to coordinate a plan to get a particular individual off the streets. It worked so well they decided to do it again and set up a weekly meeting. 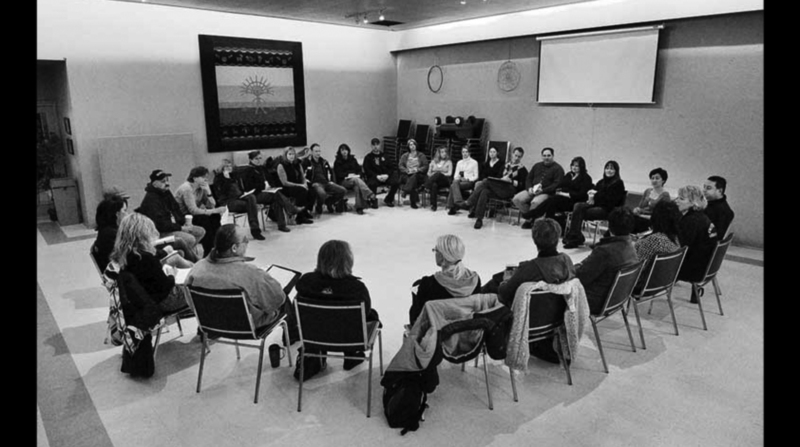 Partners in Community Collaboration (PICC) now includes people from all the service groups in town and the numbers [at each meeting] can reach 35 or 36." "Nurse Stan Marchuk (left) had a client who needed to visit the health clinic urgently so we took a few minutes at the meeting to set up an appointment for later that day. With so many care providers working together, there are a lot of resources and experience at the table and in under an hour we manage to organize inter-agency case management plans for between 10 to 20 clients." "Inn From The Cold offers sleeping mats in a warm room during the coldest months of the year. They average around 27 guests a night." "The wake-up call's at 6:00 a.m.; then comes breakfast. 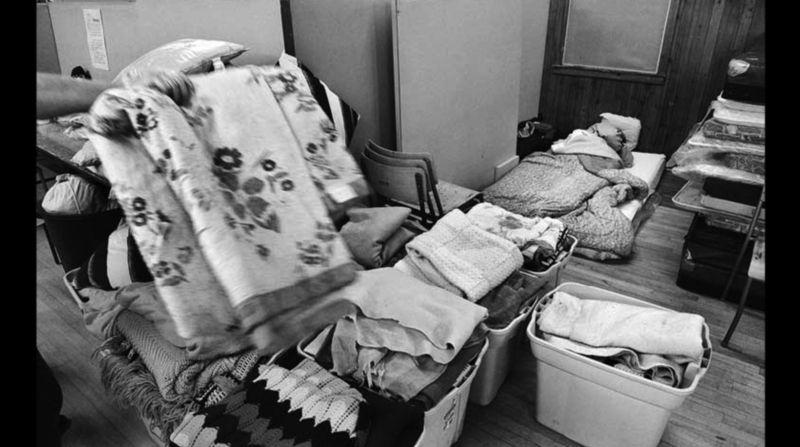 Clients have to leave by about 8:00a.m., but on this cold winter morning, volunteers allow a sick man to catch a few extra minutes sleep until they have to rouse him to fold his bedding." "In the summer, people have prospects for a day's work in the orchards and a little extra cash, but in winter, it's a long day of below zero temperatures and the thought of leaving the sheltier can be hard to face." 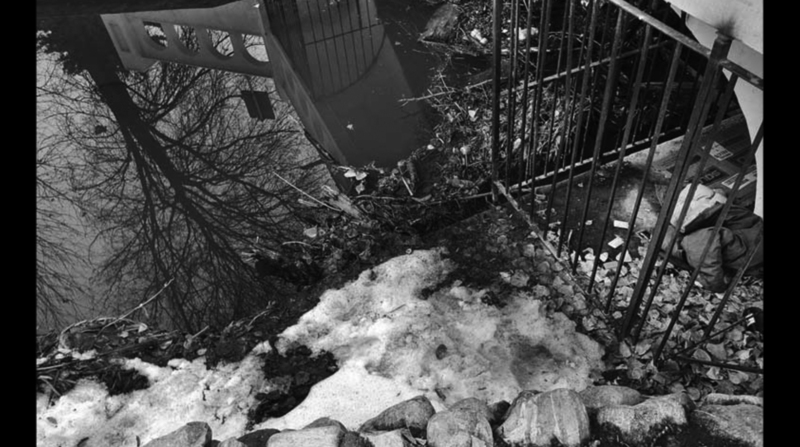 "It's not often that you find someone sleeping outside in the winter any more. Usually it will be someone's who's been banned from a shelter because of severe behaviour issues. At PICC, we brainstorm as a community how to best help them rather than just ban them." "Brian used to live on the streets. 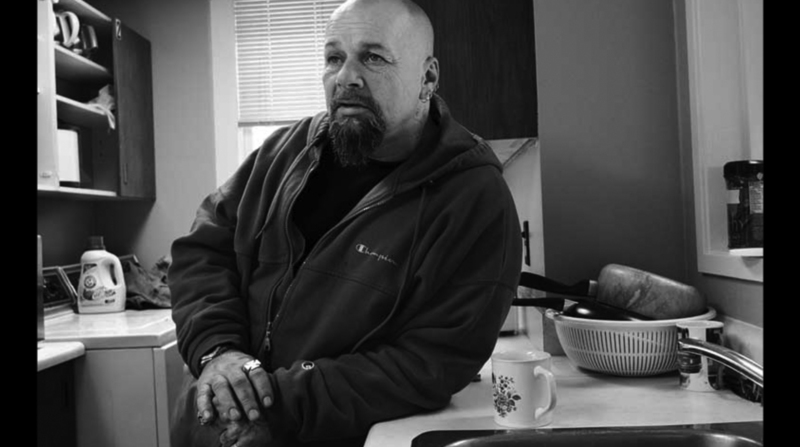 When he suffered a stroke, PICC coordinated all the help he needed to move into secure housing. But getting people into housing is only the first part of getting them off the street permanently." "Josephine is a local musician and street personality. She's ready to move off the street and came into the Outreach Urban Health Unit to see Marg Noble about a referral to transitional housing. It's part of Marg's job to make sure Josephine has all the support services she'll need. 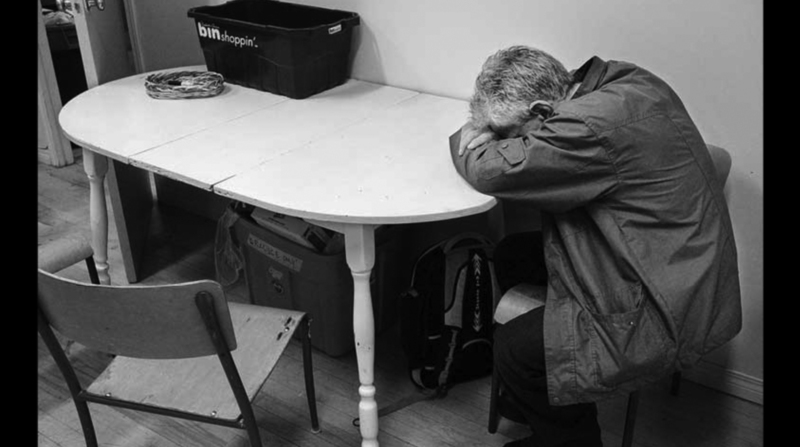 Leaving the streets for housing can be traumatic and without the right connections you can end up feeling abandoned." 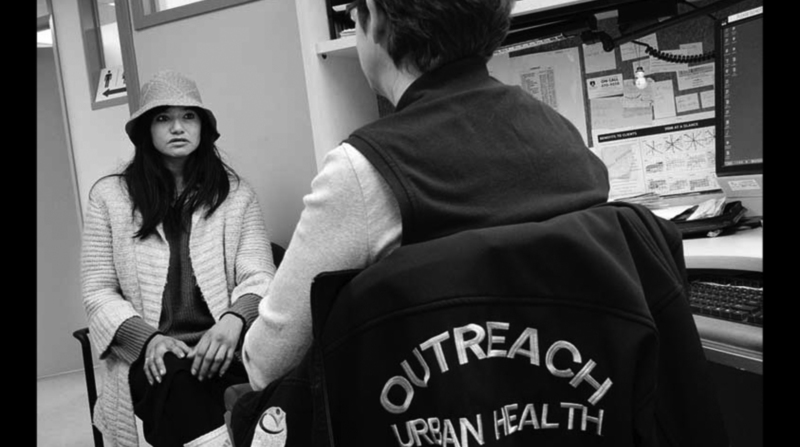 "The Outreach Urban Health Unit serves most of the city's homeless. Because our doctors aren't paid on a fee for service basis, they have the time and flexibility to deal with their complex issues. Sarah came to see Dr. Diane Imrie so they could coordinate a care plan tailored to her needs." "Getting homeless people to fill their prescriptions is a real challenge. I would estimate compliance at around 20%. 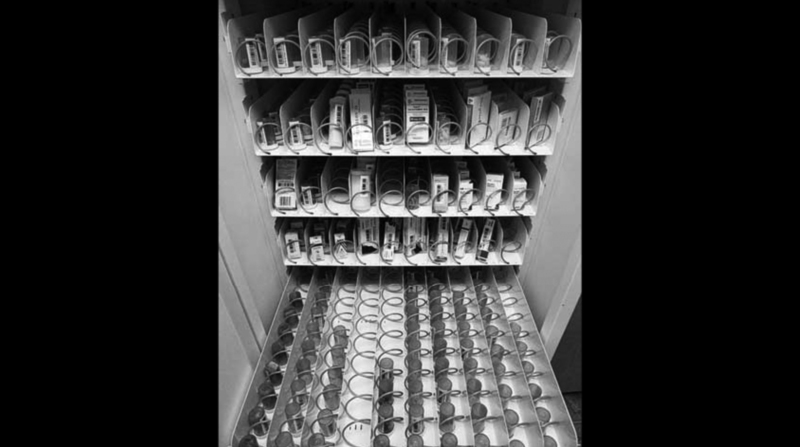 We've begun working with a pharmacist out on the coast to operate a tele pharmacy dispensing machine at Outreach Urban Health. We use a webcam to confirm the prescription and a video phone so the client can speak with a pharmacist. We can give much better care around medications now." 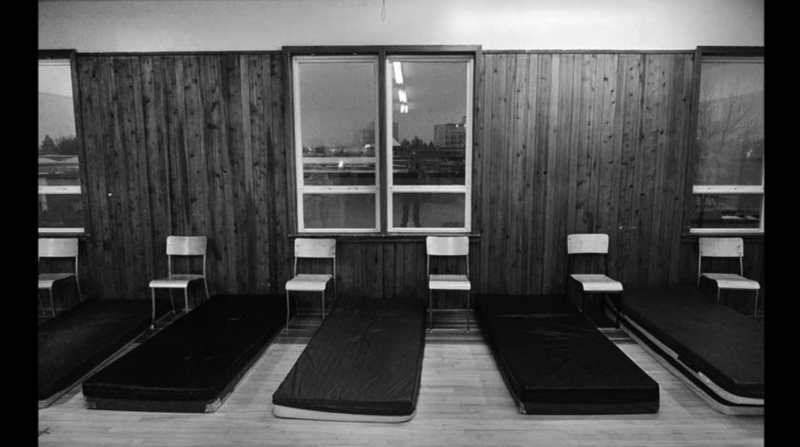 "The Drop-In Centre is a big part of the day for our homeless population. 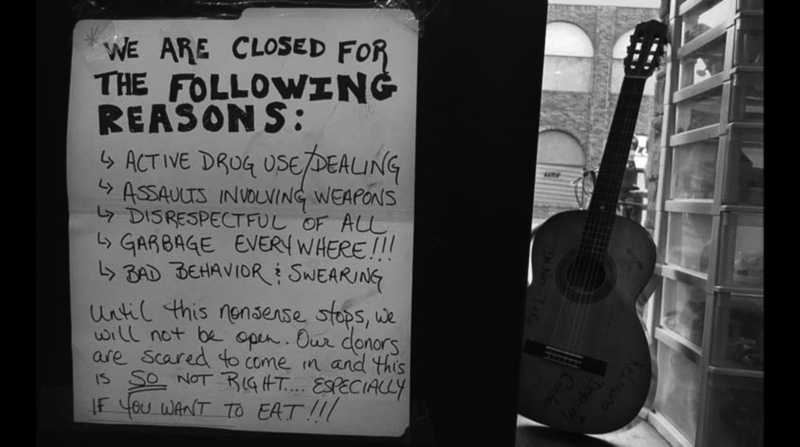 It offers hot meals, something to drink and a place to just hang out. Selena Stearns is the Executive Director of the centre. She's a kind of mother-figure to a lot of the centre's clients. Sid's one of her regulars. He's working hard to stay clean and off the street." 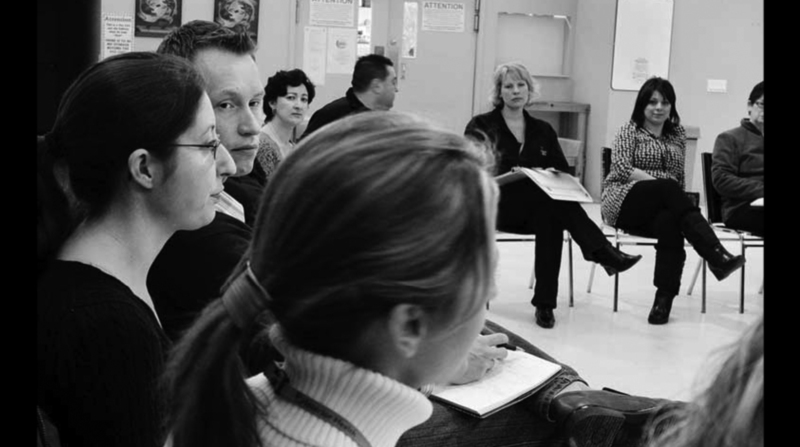 "The Drop-In Centre is a low-barrier facility. Every once in a while some of the clients will push the boundaries and, while Selena is a mother-figure, she's a strict one." "Kristian is another of Selena's regulars. He's been struggling but has real artistic talent. A lot of different people donate materials and now he's selling his paintings." "Sonja Mountain is an Aboriginal Outreach Worker at the Ki-Low-Na Friendship Centre. The mandate of her job is strongly client-centered so she can meet clients where they're at, whether it's income assistance, housing or counselling. Henry's one of her regular clients." "Woman who are dealing with addiction are in danger of having their babies apprehended if they aren't able to provide stable housing. 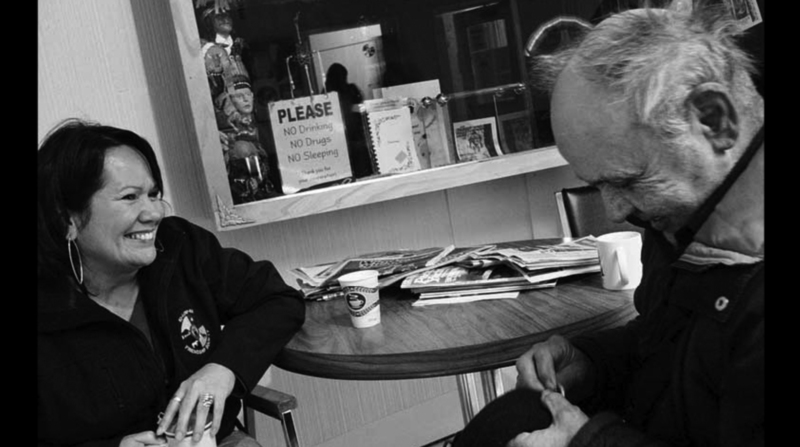 Sutherland House provides them with a home, food and supplies, along with a complete range of support services. Jennifer was living at Sutherland House when she gave birth to her son Lukas." 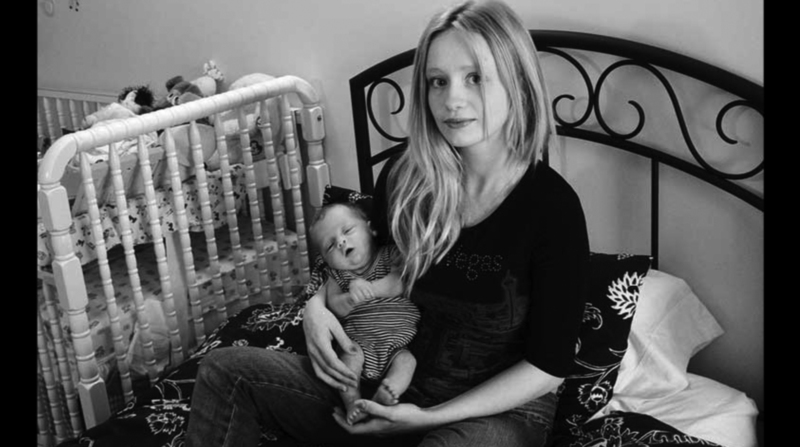 "Sherri is ready to leave Sutherland House and move to a new town with her baby and husband Cody. Lisa Marshall's a manager there and part of her job is to help them find their way through the web of social service agencies they'll need to help support their new life together." "People living on income assistance of fixed pensions can find it a challenge to make the rent. 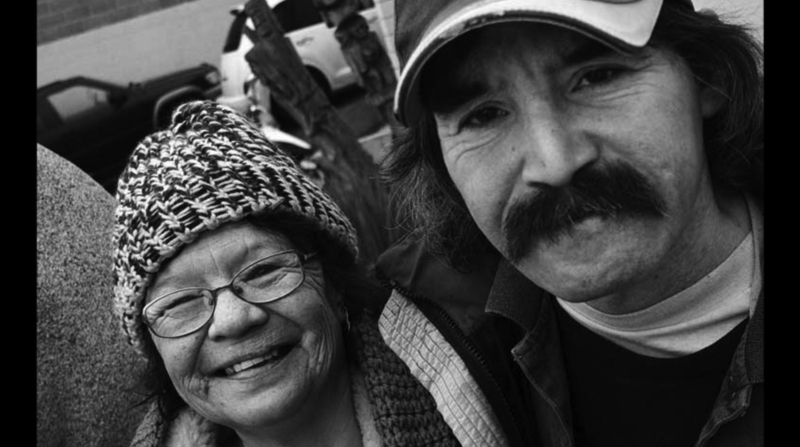 Marilyn and Reg have lived on and off the streets in Kelowna for a long time. It's going to be interesting to see what happens if the gap between income, rent, and the general cost of living keeps on increasing, but at least with PICC, there's a strong support system out there now." 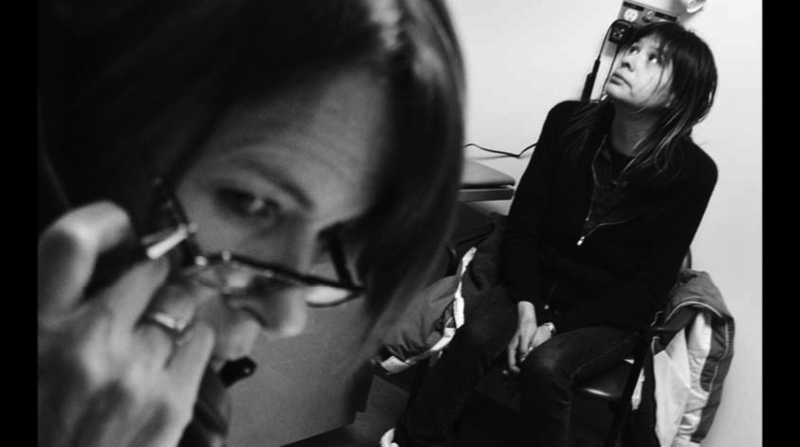 When you are destitute or homeless, good health requires much more than medical care. It can involve a combination of housing, food, addiction, fragile mental or emotional health issues. Negotiating the maze of clinics and agencies that provide help is daunting. In Kelowna, B.C., the frontline workers made a simple decision to solve this problem. They would meet for an hour once a week and collaborate to organize coordinated plans for their clients. The idea was simple and cost-effective, and the results have been impressive. 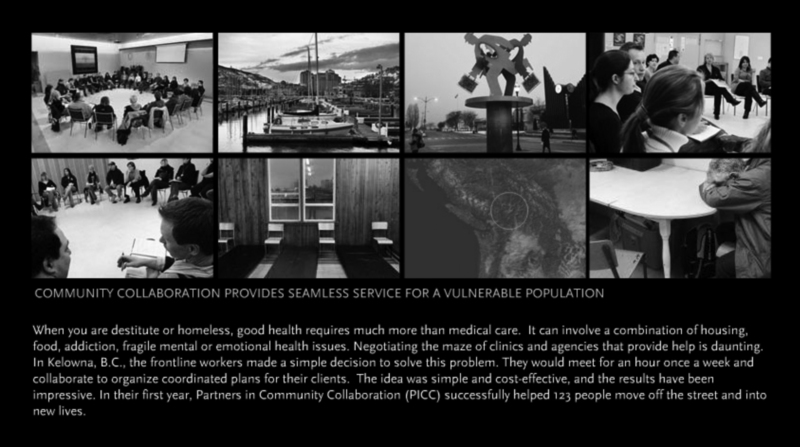 In their first year, Partners in Community Collaboration (PICC) successfully helped 123 people move off the street and into new lives.